We make butter ... not margarine! In 1987, the arrival of Balade butter in Belgium was a real revolution for those who love their food but also like a balanced diet. Far from the margarines, composed of vegetable oils, Balade butters, with cow’s milk, are naturally balanced products, combining the freshness of nature and the pleasure of eating well. With its wide range of butters rich in flavor, Balade delights the taste buds of the whole family. On the little ones’ bread in the morning or in the sandwich for lunch, these butters with the creamy texture sublime the taste of every ‘Tartine’ moment . Balade’s traditional, dairy-based expertise allows them to retain what is best about dairy products, whilst removing excess fat. What is the advantage of this? Fewer calories and less fat, but with all the enjoyment: the genuine fresh dairy taste. This is why Balade never stops developing new tasty and light products, suited to today’s lifestyles and delivering maximum enjoyment. Following on from the success of the butter, the range broadened to include other light, practical and tasty dairy products such as creams in the So Light range, butters and Omega 3 creams, chocolate spreads, sauces, milk drinks, etc. These innovative products combine the pleasure of eating well with the benefits of lightness. 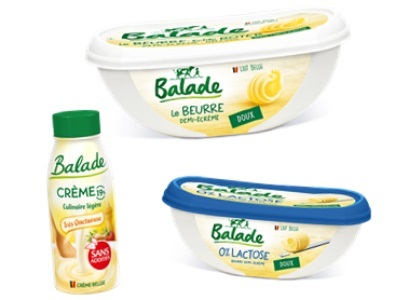 As the market leader in Belgium, Balade is continually developing new, tasty and light dairy products, suited to today’s lifestyles. 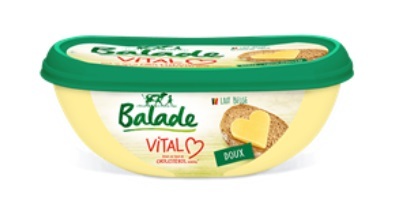 After Balade Vital butter, which won the 2014 ‘INN’ Food Innovation of the Year Award, the brand launched Balade Vital, a light cream with only 12% fat and 80% less saturated fat than double cream. This included patented technology that required several years of research. Because nature gives its best to us, Balade makes sure that in return, it reduces the environmental impact of its business to a minimum: no chemical processing, responsible and progressively lower use of energy and raw materials, reduced packaging weight, use of recycled materials, etc. A traditional cheese brand in Brazil, Polenghi is now synonymous with high quality and innovation. With a wide range of cheese products for all uses and for everyday meals and special occasions alike, Polenghi provides consumers with healthy, delicious and practical products.